The Cambrian Coast Line is probably the UK’s prettiest railway line running through the Snowdonia National Park and operating between Aberystwyth in the south and Pwllheli in the north. Discover medieval castles, sandy beaches, nature reserves, steam railways, museums and art galleries all without the hassle of finding a car parking spot when the rest of the world appear to be attempting the exact same thing. For a stress free trip, take the train and hop on and off when and where you fancy. Check the train times as services can be infrequent especially on a Sunday. 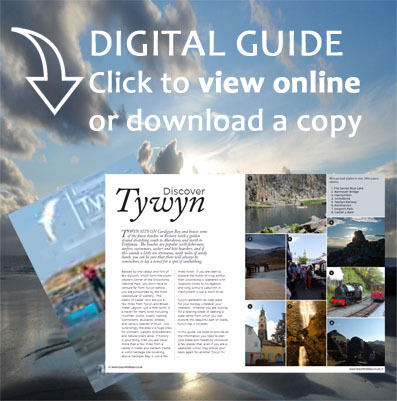 A full printed timetable is available for you to takeaway from Tywyn Station as well as most staffed stations. Alternatively, you can do a bit of pre­planning by downloading a PDF from www.arrivatrainswales.co.uk or www.networkrail.co.uk. For temporary changes, check the National Rail (www.nationrail.co.uk) website or telephone 0845 748 4950. The larger stations have departure boards but you can access the Internet versions from your mobile phone by visiting www.nationalrail.co.uk/times_fares/ldb.aspx. You can also use their TrainTracker app by texting ‘dep’ then a station name (or its 3 ­character abbreviation) to 84950 for details of the next trains due and whether they are on-time. Visit National Rail (www.nationalrail.co.uk/times_fares/1954.aspx#simulator) for more information. Alternatively, Cross Country Trains provide a ‘Train Tickets’ app for your smartphone which provides real-time information on whether a train is on time, how late it is etc. Most of the smaller stations are request stops or halts which means that unless you tell the conductor well in advance of your intended destination you are more than likely going to get a good view of the platform as you sail by (train by?). Similarly, if you are hoping to catch a train from a request stop, don’t wait until you see the whites of the driver’s eyes before giving a friendly wave as they may not be prepared to test­-out their train’s breaking system just for you. Whilst you can change trains at Dyfi Junction, please be aware that this is just a couple of platforms in a field. You may find that changing at Machynlleth is more comfortable especially in the unlikely event of inclement conditions. A family ticket is good for two adults & two children. Prices subject to change. If you are visiting any of the attractions accessible on­ route, remember to present your rail ticket as many offer discounts on admission. For a list of these attractions visit Arriva Trains (www.arrivatrainswales.co.uk/Discounts/) and save some holiday cash. Aberystwyth, or ‘Aber’, as it known locally, is regarded as the capital of Mid Wales and hosts Wales’ National Library, a Victorian camera obscura (google it! ), and the Vale of Rheidol Steam Railway. If you alight at Aber, the Steam Railway shares the station and runs 12 miles to the waterfalls of Devil’s Bridge. Aber is certainly the largest settlement in the area and is crammed with chain stores as well as a range of specialist shops. Seaside resort where the beach is just 5­ minutes from the station. But don’t rush off as the station itself houses its own museum stuffed full of items related to local railway history. Go back in time and visit the lovingly restored ticket office and waiting room which houses interactive displays. Need a better reason to visit: well you can save a few holiday pennies as entry is free! Just down the road is the Animalarium – a growing zoo where most of its exhibits are unwanted exotic pets. A 2 mile walk/cycle north from the station is the Ynyslas nature reserve where you get to stroll along boardwalks through dunes at all stages of growth: from mature dunes dotted with rare orchids, in June and July, through to baby dunes being whipped ­up by the sea breezes. Keep an eye­out for the myriad of creatures that make this special habitat their home. Ynyslas has a visitor centre open between Easter and September. Give them a call on 01970 871640 to see if the wardens are planning any guided walks or other activities during your stay. And finally, Borth, along with Tywyn, has its own submerged forest which legend has it are the remains of the mythical Cantre’r Gwaelod, the Welsh Atlantis. The Dyfi junction is where the line divides: north to Pwllheli and south to Aberyswyth. If you are planning on visiting the RSPB Ynyshir nature reserve for a bit of nature spotting, then this is your stop. There is a terrific mix of habitats and beasties to spy on with 6 viewing hides, trails and a visitor centre with shop and refreshment facilities. Check­out their website (www.rspb.org.uk/discoverandenjoynature/seenature/reserves/guide/y/ynys­hir/) to see if there are any special events planned during your stay. However, before you head off for the reserve take a peek at the station’s nesting pole where Dyfi’s Ospreys Monty & Nora have been known to nest. As an aside, Ynyshir is the new home of the BBC’s Springwatch. Dyfi Junction is also where you need to detrain to visit the Dyfi Furnace. If you are planning to visit the furnace, telephone ahead to check if it is manned and open that day as if it isn’t all you get to do is peer in through the bars and windows as we did. A typical small Welsh market town with a big history. Machynlleth is the ancient capital of Wales and has special significance because of its connection with Owain Glyndwr – Owain was Wales’ Braveheart and led the campaign for Welsh independence in the early part of the the 15th century. Machynlleth was the site for the first Welsh Parliament held in 1404 and the Parliament buildings are still open to the public today. If you visit on a Wednesday, then the High Street is taken over by the weekly market – a 700 year old event! There are a range of specialist shops selling crafts, antiques and souvenirs as well as a couple of cafes. Machynlleth also plays host to Wales’ Museum of Modern Art which contains more than 250 works of art. You can also take a short bus ride to the to the Centre for Alternative Technology – a visitor attraction that has been promoting sustainable living for over 40 years. Penhelig is an unstaffed halt that services the eastern outskirts of Aberdovey. Aberdovey Station is a similarly unstaffed halt that services the western end of this picturesque village. If you are planning to visit Aberdovey, then this is your stop. Try a spot of crabbing from the pier or secrete yourself in one of the hostelries that line the seafront. Aberdovey has a great beach and there are a number of walks which you can take to explore the area. This is our home and famously connected with the daddy of all heritage railways – the Talyllyn Railway. Talyllyn was the first railway in the world to be rescued by volunteers and so inspired all those that followed. Network Rail have been trying to close this station for years as the reason for its existence, the now derelict army base, was demolished in the 1980s. Not surprisingly, Tonfanau is probably the UK’s least visited station. Little remains of the base today except for a few walls and foundations. For a bit of history on the army base visit our blog. There is one more reason to visit Tonfanau: this is the home of the Tonfanau Road Racing. Check­out their site (www.tonfanauroadracing.co.uk/) for a list of the race meetings held here during the summer. Llwyngwril is a coastal village with strong links to the Quaker movement. If you are interested in pre-historic monuments, then Castell­ y­ Gaer is a hill fort that overlooks the village. In truth, there is very little that remains of the fort and it is probably not worth the climb unless you are really into rubble, but it’s here and it’s going nowhere. There are also numerous standing stones in the area. Quiet seaside village with 3 miles’ of sandy beach still edged with wartime fortifications and home to the Fairbourne and Barmouth Steam Railway. 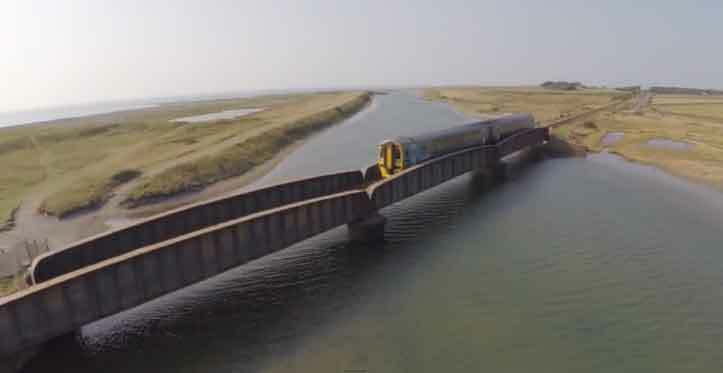 This railway runs from the mainline station to the mouth of the Mawddach Estuary where you can catch a ferry to Barmouth in the summer months. But don’t rush off as one of Snowdonia’s hidden gems is secreted in the hills overlooking the village. The Blue Lake is only a 30 minute walk from the station and is well worth a visit. If you are a keen bird watcher or cyclist then plan a stop at Morfa Mawddach as the station marks the start of the 9 mile Mawddach Trail which follows the route of a disused Great Western railway line along the estuary to Dolgellau. The estuary is a real magnet for migratory birds and the trail takes you through RSPB protected areas. I can recommend stopping off at Mawddach, even if you are planning to visit Barmouth, as the views from the preserved wooden railway bridge are spectacular. For more information visit our guide to the Mawddach Trail. Barmouth is one of the Cambrian Coasts most popular seaside destinations. As you would expect, there’s candy floss, donkey rides, fish & chips, and a mini funfair where you can test yourself on the dodgems. There are numerous pubs and places where you can pick­up a snack. In the harbour area, below ‘The Rock’ (the old town), is the Sailors’ Institute where you can explore Barmouth’s maritime history. Visit Ty Gwyn, the oldest building in Barmouth and home to the Shipwreck Museum, which features historical articles and photographs of Barmouth as a port. Ty Gwyn also houses ‘treasure’ recovered from the wrecks of two ships that foundered on St Patrick’s causeway. Ty Crwn (or Round House) was built in 1834 as a ‘lock up’ and you can visit today to take a peek at life as a prisoner in the 1830s. Visit our post or more details on Barmouth’s Heritage Trail. Llanaber Church is one of the finest examples of early gothic architecture in the country and houses the Llanaber Stones: two early Christian stones dating from the 5th & ­6th century both of which carry Latin inscriptions. The Church is 100 yards from the station. Serves the village of Talybont. Boasts a number of prehistoric cromlechs and burial chambers with one dating from around 4,000 BC – one of the earliest cairns built in the Britain. Stopping off point for the famous Shell Island (about 2 ­miles away), a peninsula well ­known for the variety of seashells that wash up on its beaches. Has a few popular walks. If you are planning a holiday in Snowdonia, then you really must find time to visit one of our historic castles. Harlech Castle is a world heritage site which towers above Cardigan Bay atop a spur of rock. The castle was built by Edward I in the 13th century as part of his formidable ‘iron ring’ of fortresses designed to keep a watchful eye over the troublesome Welsh. Whilst the walk from the station to the castle is a little steep, it is well­ worth the effort. As well as the castle there are a few cafes and souvenir shops. Not a lot going on here and no real reason to stop unless you are visiting friends in the area. These stations bracket the village of Penrhyndeudraeth and you are more likely to stop ­off at Minffordd as this is the closest station to Portmeirion – the unique Italianette ­styled village built by the Welsh architect Clough Williams­Ellis. Portmeirion attracts over 1⁄4 million visitors every year and is famous as the setting for the cult television show ‘The Prisoner’. Porthmadog was once a great seaport supplying slate mined at Blaenau Ffestiniog to the world. If you are a steam railway buff it is home to two stalwarts: the Ffestiniog Railway to Blaenau Ffestiniog, and the Welsh Highland Railway which runs as far as Caernarfon. Get off the train at Blaenau Ffestiniog and visit the slate caverns to see where the world got its slate. The town also hosts the Maritime Museum where you can discover the history of the Tall Ships that plied their trade from here. Not visited enough castles? Well Criccieth has another one. Whilst not as impressive as Harlech, which you can just about see across the waters, it is well worth a visit. Services a nearby caravan park and a Haven. Pwllheli has long been popular with holiday makers with its fine beaches and higgledy piggledy streets which are full of character. It has a marina from which you can take a pleasure cruise along the spectacular Llyn coastline or visit the mysterious Bardsey Island rumoured to be the burial place of King Arthur and 20,000 saints. For more information on Bardsey, visit our guide at www.tywynholidays.co.uk/historyoftywyn.html. The real joy of the Cambrian Line is that the journey becomes an event in itself as there is plenty to gaze at as you travel from station to station whatever the time of year. There can be very few journeys that take you passed mountains, meadows, woodlands, mudflats, saltmarshes, seas & sand dunes with a good old bog thrown in for good measure. Travel during the winter storms and where the track runs next to the sea your train is likely to be thrashed by the waves which can be a bit of a shock to the unwary. A sure fire way of avoiding those ‘are we there yets?’ is to travel by train. For bus times, call Traveline on 0871 200 2233 or visit www.traveline.info. Cambrian Trailways (www.thecambrianline.co.uk/enhanceyourjourney/trailways/) is also worth checking ­out for ideas on things to do by rail in this spectacular part of Snowdonia … and don’t forget that money saving tip for discounts on admission when you present your rail ticket. This entry was posted in Activities and Attractions, Services, Snowdonia by train, Towns and Villages and tagged Cambrian Railway, Snowdonia by Rail, Snowdonia by Train, Snowdonia Car-free on 25 April, 2015 by Paula.